I made the decision to start off my UCI cyclocross season this year at RenoCross, this meant that I was skipping one of my favorite races of every year; Rochester Cyclocross. What this did allow me to do was to attend my favorite NON-UCI race of the season: The Alma GP of Cyclocross! The race promoter JB Hancock; also nicknamed the PT Barnum of American cyclocross by my co-host on Bike Shop CX, Mr. David Palan; always manages to get a high profile rider to attend this event. 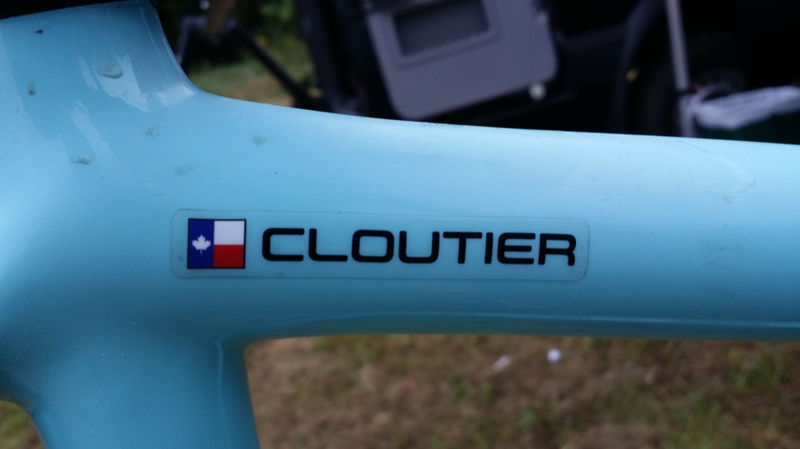 This year that rider was Tyler Cloutier. I was asked to pit and support Tyler for the race and happily agreed as he is one of the nicest and friendliest racers in all of cyclocross. So as a result of that I got to spend some time with Tyler’s bikes and see what he plans to attack this 2018-19 cyclocross season with as far as race machines go. 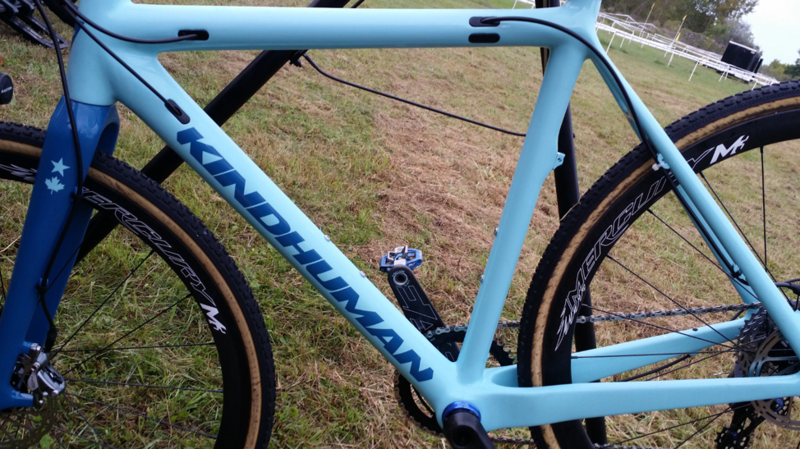 The internally routed Kind Human cyclocross disc caught lots of attention at the race and for good reason. This bike frame is absolutely beautiful. The pictures don’t do it justice as the paint looks really deep and the color is a rich blue. Tyler has two of these bikes. The other frame is the color of this bikes fork. While the fork on the other bike is the color of this bikes frame. The unused cable port on the top tube is of course for a front derailleur cable should you choose to run one. 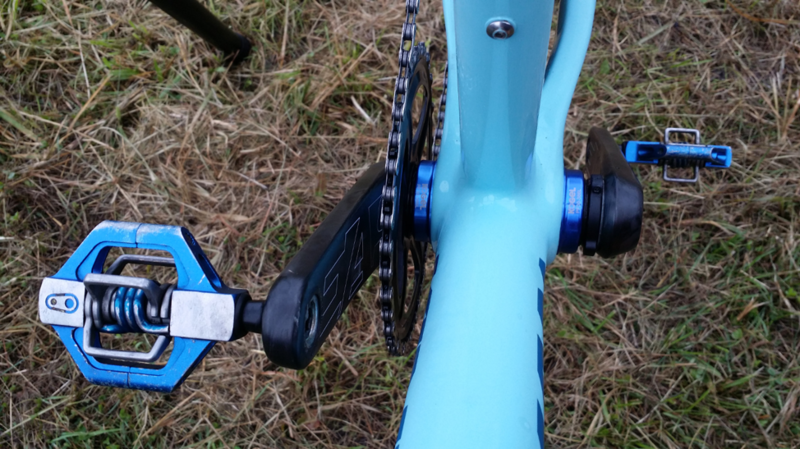 The darker blue touches of the Kogel bearings bottom bracket and the Crankbrothers Candy pedals not only compliment the bike’s paint job but they also are among the best in the cyclocross business. Kogel bottom brackets are quickly becoming the go to bottom bracket in the industry. Another positive of this frame in my opinion is the standard PF30 bottom bracket. It’s a great choice for a cyclocross bike. High performance, easy to fix and get parts for, even when you are at a race and have an emergency. It was cool to see that in what many riders consider the most important contact point of their bike, Tyler went with an SDG Bel-Air 2.0. 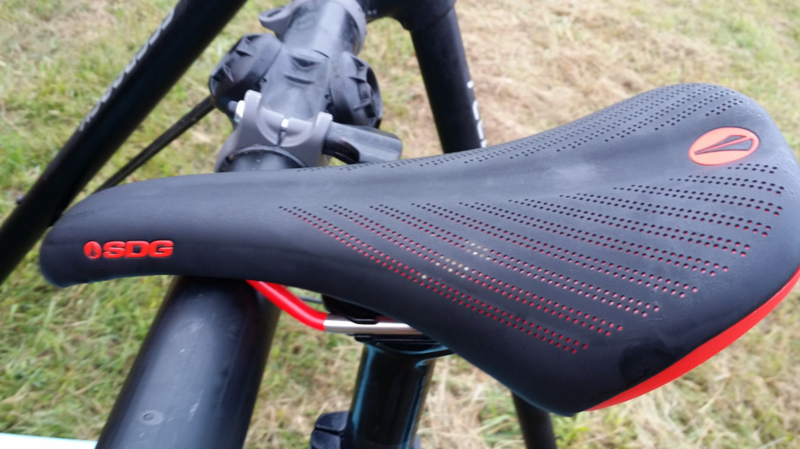 This saddle is in the SDG “Performance” category and slightly outside their “Duster” saddle that is chosen by many CX racers. This saddle is my personal favorite in the industry right now though so it was cool to see a rider of Tyler’s caliber choose it as well. The red color also gives the bike a great accent point. 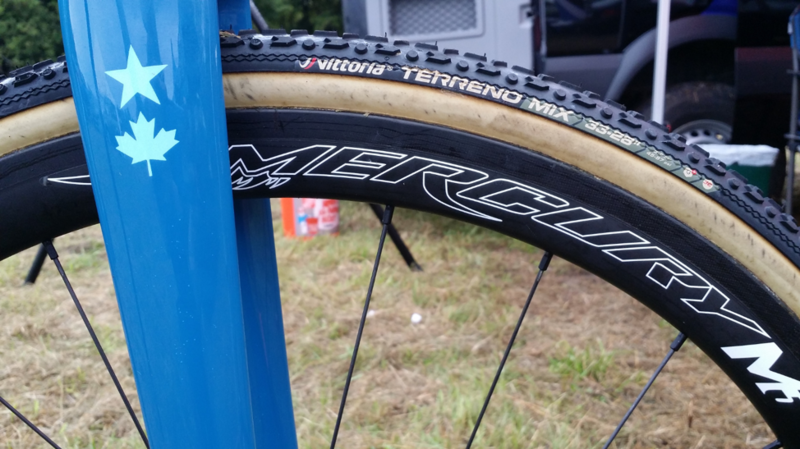 Mercury wheels are rock solid and provide a great base for the Vittoria Terreno Mix tires that Tyler chose to ride. Most riders on the day chose a mix tread like the Terreno or Grifo. For the heart of the drivetrain, this bike did not disappoint. 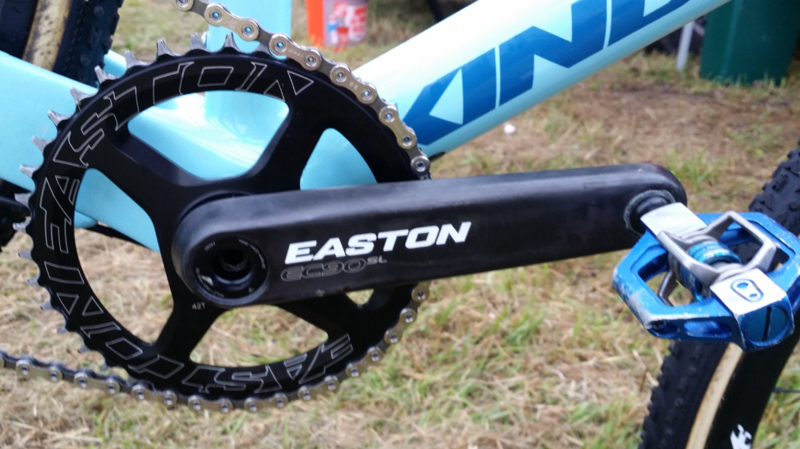 The Easton EC90 is the best crank in the business. Changing chainrings is very easy and only requires the Shimano 22 pin bottom bracket tool that almost every race mechanic already has and if you don’t, it is an inexpensive tool to purchase. Though I hear they are a bit difficult to obtain over in Europe so plan accordingly. This crank is incredibly stiff yet also feels like it will float away if you don’t hold it down as well. 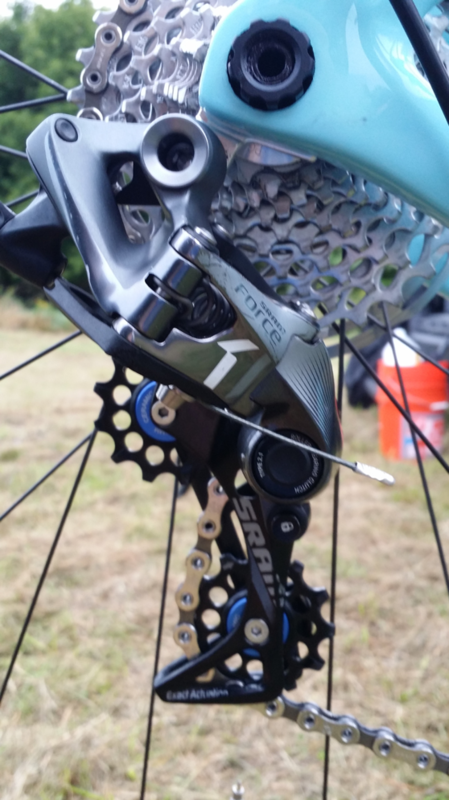 The rest of the drivetrain is a standard SRAM Force set up including rear derailleur, shifters, and hydro brakes. They all just work and work well. I apologize for not getting a picture of it but Tyler also chooses to continue to run 160 rotors front and rear for simplicity and greater stopping power. In closing, this “American-Canadian” has put together a sweet machine that is a killer on the course and a beautiful thing to look at. When asked Tyler says that this bike tracks like no other he has ridden. He can go into corners with complete confidence, knowing the bike will go exactly where he wants it to go. Thanks for reading this first installment of my tech articles for CXHairs for the 2018-19 season. I have a lot of other bikes that I plan on bringing you as the season progresses. If you have any suggestions for a bike you’d like to see hit me up on twitter or instagram@bikeshopcx. Also check out our tech podcast Bike Shop CX on The Wide Angle Podium. Those shifters are tilted up way high. Seems more folks are doing that. Yeah I agree it does. Tyler likes to ride pretty low when he is in the drops but likes the shifters more up like that.